College is perhaps one of the most wonderful places to start celebrating Christmas. However, it can sometimes feel a bit tricky to get in the spirit of things with papers and tests looming over you—particularly if this your first year away at school. It’s normal to feel a bit melancholy as the holidays roll around. After all, you might be far from home and family, and things might not seem very cheerful with a whole host of finals around the corner. Don’t despair! Just because there is much to do doesn’t mean that you can’t celebrate and make things festive. We’ve compiled a list of ideas for you that will hopefully make this season just a little bit brighter. A couple of strings of white or colored twinkle lights can really do a lot to spruce up a dorm room. Circle them around your window, or use 3M hooks to string them around your ceiling. You could also wrap them around your desk or your bed’s headboard if hanging them on hooks isn’t an option in your dorm. If you’re having trouble figuring out what kind of configuration to arrange the lights in, There’s nothing cozier than turning all the lights off and watching movies or enjoying dinner under the glow of Christmas lights. There’s nary a college campus that will be without a variety of Christmas events once December rolls around. Check out the theater department’s lineup, as well as the music department, as there’s sure to be a myriad of Christmas concerts and shows to attend. It’s also a good idea to see if you’re campus has an official tree-lighting ceremony. Watching a tree-lighting, particularly if there’s music involved, can be a truly unique, special experience. Netflix produces a whole new slew of Christmas movies each year, but of course, you’ve got to leave a little room for the classics. Whether you plan a Christmas-movie marathon ahead of time, or you just grab a few friends from your hall to watch something last minute, watching Christmas films with your pals can really help get you in the spirit of things! 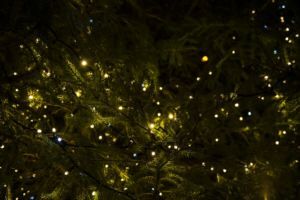 Advent is the season of the year leading up to Christmas, and it comes from the Latin word adventus, which means “coming” or “visit.” There are a variety of ways you can honor the season of Advent, and there’s definitely room to try a few different things. Many people use a “Jesse Tree,” which includes a variety of ornaments that help tell the story of the Gospel. Some people use an “Advent Calendar” and hide gifts in it to open each day. Whether you do something every day, or you just have a single feast where you share a devotional about the season, celebrating Advent can quiet your heart and keep you focused on Christ throughout the Christmas season. Whether you do a Secret Santa gift exchange or you each of your roommates a special something, participating in a gift exchange can be a lot of fun! Don’t let money stand in the way—create a piece of art, give away a recipe and some freshly baked goods, or gift your friend experience of some sort. Make your gift exchange festive and enjoy some Christmas cookies and play Christmas music while you open presents! There’s a lot to do outside and around town when the Christmas season hits. Bundle up and visit a Christmas tree farm with a group of friends—make sure to drink a mug of hot cider once you come inside! Go caroling (either outside or throughout your dorm), or go sledding! You can never go wrong with building a snowman if you live in a climate that gets a good amount of snow. Be sure to pose for pictures with your creation! Other fun ideas include ice skating (indoor or outdoor), going to a holiday parade, or driving around to look at Christmas lights. Some neighborhoods get pretty creative with their decor, and if you pop some popcorn to take with you on the ride, you basically get your own private, on-the-go show!